Calcium ions (Ca2+) are versatile messengers that need to be tidily regulated in time and space in order to create a large number of signals. The coupling between Ca2+ entry and Ca2+ refilling is playing a central role in this Ca2+ homeostasis. 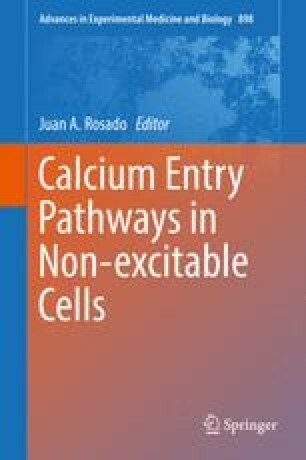 Since the capacitative Ca2+ entry has been described, different mechanisms have been proposed in order to explain how the Ca2+ entry could be under control of intracellular store Ca2+ depletion. Today, in addition of STIM1 and Orai1, the two major elements of SOCe, increasing attention is put on the role of the transient receptor potential canonical (TRPC), that can form protein clusters with Orai1, and Sarco/endoplasmic reticulum Ca2+ATPases (SERCAs), that refill the stores and are also located in the same environment than SOC clusters. Altogether, these proteins elaborate either Ca2+ microdomains in the vicinity of the membrane or larger Ca2+ increases overtaking the whole cell. The coupling between Ca2+ entry and Ca2+ refilling can possibly act much further away from the plasma membrane. Ca2+, uptaken by SERCAs, have been described to move faster and further in the ER than in the cytosol and to create specific signal that depends on Ca2+ entry but at longer distance from it. The complexity of such created Ca2+ currents resides in the heteromeric nature of channels as well as the presence of different intracellular stores controlled by SERCA2b and SERCA3, respectively. A role for mitochondria has also been explored. To date, mitochondria are other crucial compartments that play an important role in Ca2+ homeostasis. Although mitochondria mostly interact with intracellular stores, coupling of Ca2+ entry and mitochondria cannot be completely rule out.